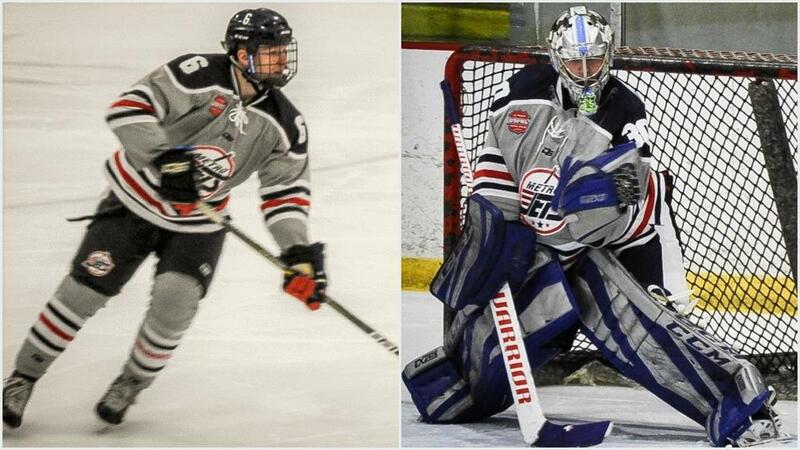 FRASER, Mich. – The offseason means college commitments for the Metro Jets. After forward Jhuwon Davis and defenseman Devlin Macaulay committed to NCAA Division III hockey for New England College in recent weeks, two more players have committed to play college hockey. Jets defenseman Cory Schwartz will play for Oakland University and goaltender Anthony Carlier is set to join Rochester College. Both were first-year players for the Jets during the 2018-19 season. Jets coach-GM Justin Quenneville to see both standouts moving up the hockey development ladder. “Both Cory and ‘Carly’ were instrumental parts of our program and both benefited from buying in from the start,” said Quenneville. “It’s a sad day to see the last Schwartz brother don a Jets jersey, but Cory jumped into a young ‘D’ core this season and helped immediately. He has a simple skill set that brought consistency to his game and he played with an edge that kept teams honest. Carly is an athletic goalie and high-character player. He was a big reason for the early success on the ice for our guys and played hard right to the end. Schwartz said he chose OU because the school has everything he was looking for in terms of academics and hockey. This past season for the Jets, the 19-year-old Warren native posted nine goals and 19 points in 43 games. For Carlier, a Clinton Township native who turned 20 on March 13, getting the chance to play college hockey is a dream come true. During the 2018-19 season, Carlier went 10-9-0 with a 3.10 GAA, a .916 save percentage and three shutouts. “The Jets played a major role in me getting this opportunity,” said Carlier. “Just by putting a Jets jersey on, it’s very easy to get looks because the Jets are a first-class organization. By playing there, it shows colleges you’re a committed player and are a team-first type of guy. Working with Randy (Wilson) has given me the tools needed to be a big part of my team’s success this season. Without him or any of the coaches, I would’ve never reached my full potential as a goaltender. It’s a great place to play. “Between Randy, Q and (Jets associate head coach) Jamie Lovell, they are so committed to getting the best out of you. Jamie puts in countless hours with us in the gym to help us get stronger and prevent injuries, but it doesn’t stop there. From our great owner Pete (Cammick), to the coaches, to the support of my teammates, and even the guys like (equipment managers) Kenny (Sidun) and Paulie (Sheridan) and everyone involved with game-day operations, it makes it easy to be a hockey player and focus on being the best you can be. Many more college commitments are expected for Jets players as the spring and summer months wear on.